Radius Displays continues to work with Louis Vuitton to bring their stunning store designs to reality. 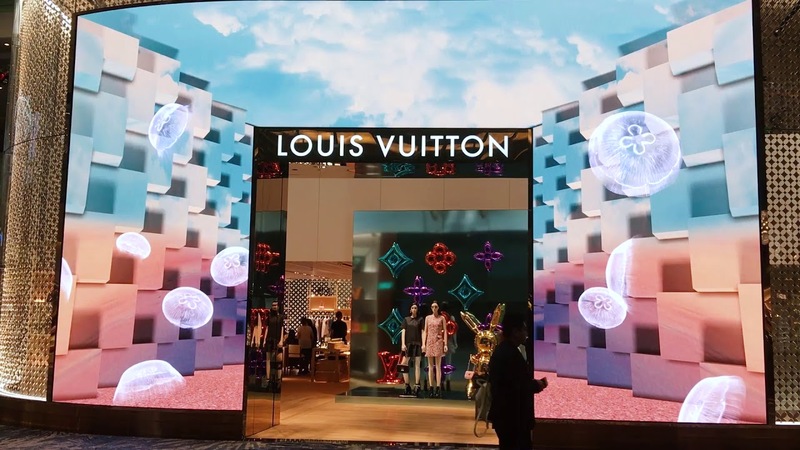 For over 10 years, Radius Displays has worked alongside Louis Vuitton to create and construct unique digital signage in Louis Vuitton retail stores throughout the world. This amazing digital storefront is the largest LED display in Singapore’s Changi Airport and it’s Louis Vuitton’s first-ever airport store in south Asia. The airport is one of the busiest airports in the world serving over 380 countries and almost 60 million passengers a year. Radius Displays provided and installed the dazzling LED storefront in December 2017. The super high resolution, curved, 2.5mm LED display is 6 meters high and 10.32 meters wide with a total resolution of 4128 (W) x 2400 (H). Over 7 million pixels on 44 custom LED cabinets seamlessly make up the storefront display.